© PRAKASH SINGH/AFP/AFP/Getty Images US Secretary of Defense Jim Mattis (L) sits next to US Secretary of State Mike Pompeo (R) as they present statements to the media following a meeting with their Indian counterparts in New Delhi on September 6, 2018. US Secretary of Defense James Mattis made an unexpected trip to Afghanistan Friday, his visit coming as the US tries to make headway in the country after 17 years of war. Mattis touched down in the country Friday morning and is scheduled to meet with Army Gen. Scott Miller, the new Commander of Resolute Support and US Forces-Afghanistan, who assumed the role last week. Earlier this week, US Secretary of State Mike Pompeo named veteran diplomat Zalmay Khalilzad as a newly-named State Department special envoy to Afghanistan. Khalilzad, Pompeo said, would be "full time focused on developing the opportunities to get the Afghans and the Taliban to come to a reconciliation." The topic of reconciliation was a prominent one as both secretaries traveled the region this week. 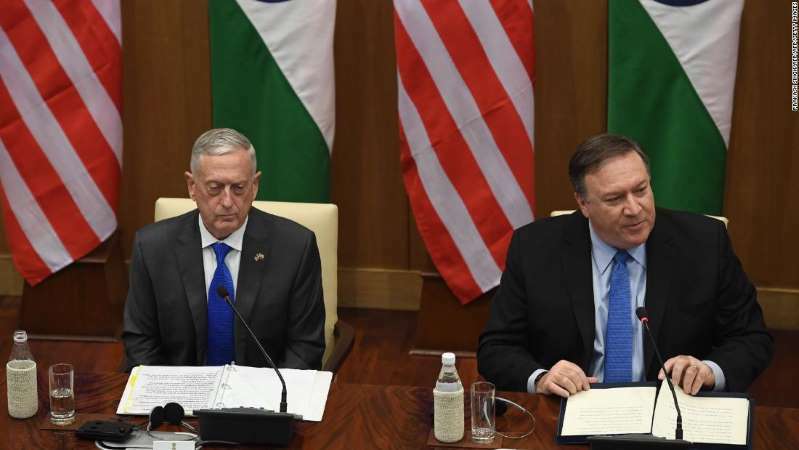 During a dialogue in New Delhi on Thursday, Pompeo, Mattis, and their Indian counterparts, "reaffirmed their shared commitment to a united, sovereign, democratic, inclusive, stable, prosperous, and peaceful Afghanistan," according to a joint statement. On Wednesday, Pompeo told reporters he discussed with Pakistani officials "the work that we all know that we need to do to try and develop a peaceful resolution in Afghanistan, which benefits certainly Afghanistan but also the United States and Pakistan." The US has accused Pakistan of granting a safe haven to militants waging war in neighboring Afghanistan -- a charge Pakistan denies. In July, a senior State Department official met for discussions with Taliban officials in Doha, Qatar. The two secretaries touched down in the country amid a bloody start to September. One US service member was killed and another was wounded Monday in "an apparent insider attack" in eastern Afghanistan, according to a statement from the NATO-led coalition in Afghanistan, Resolute Support. On Wednesday, 20 people -- including two journalists -- were killed in Kabul in twin bomb attacks on a wrestling club. ISIS claimed responsibility for that attack. A recent UN report said the number of Afghan civilians killed in the first six months of this year has reached a record high. CNN's Ehsan Popalzai and Brad Wilkinson contributed to this report.